HEMCO Corporation proudly exhibited at Engineers Week 2019. The 68th annual engineers week celebration, held February 21st at the Downtown Marriott Muehlebach Tower, Imperial Ballroom. Hosted by the Western Chapter Missouri Society of Professional Engineers (MSPE) and the Easter Chapter Kansas Society of Professional Engineers (KSPE). HEMCO Corporation attended the 30th annual meeting and trade show at Rokefeller University, New York City, November 14-16 2018. SEFA Advisory Board Member Jay Bargmann led a panel including representatives from the University. SEFA has two new drafts of Recommended Practices for review by the Membership. The updated draft of the Lab Ventilation Design Management Guide is available for review. HEMCO Corporation celebrated it 60 Anniversay in on March 22nd 2018. HEMCO Corporation also known as Hill Engineering and Manufacturing Company, was joined by members of the Independence Chamber of Commerce for a Buisness before hours event. As part of the festivities Independence declared March 22nd HEMCO day. 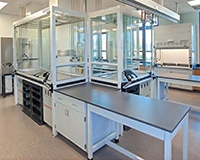 The core labs include a Soft & Hybrid Materials Facility, Bio-Chemical Lab and Imaging Lab. Staffed by full time technicians who can offer instruction on operation, maintenance and best practices for these shared resources, the core labs provide access to cutting edge equipment. These facilities are located on the basement loop that connects all four buildings on the quad, making them easy to access by many researchers from outside. 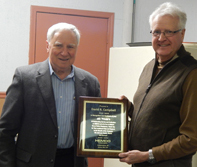 January 26th 2016, Ron Hill congratulates David Campbell on the anniversary of his 40 years of service to HEMCO Corporation.. As part of the ceremony Dave was named as President of HEMCO Corporation. 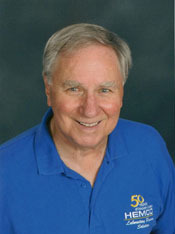 Ron Hill will remain as Co-Founder, CEO and COE. The Hill Engineering Research & Development Center has been created to allow students to focus on sustainable energy research. The building is divided into three pods. The first two pods contain interior high-bay fabrication & work areas, as well as supplemental storage areas. The third pod is a detached, open-air mechanical research yard, the ground floor is a concrete slab deck which will house the Eco Hawks syngas machine while the upper floor is galvanized steel grating to support photovoltaic research. The facility meets the LEED platinum rating. Sustainable features: the use of reclaimed materials & highly recycled materials such as glass, aluminum & steel; a super insulated structure; an advanced mechanical system that provides efficient means of heating & cooling via an underground cistern that reduces potable water demands & storm water run off. Ronald and Sue Hill, have made a gift to support the construction and equipping of the Hill Engineering Research and Development Center on KU’s west campus. The center, which will be completed later this spring,will house KU Eco Hawks, a student research program of the School of Engineering that focuses on developing innovative sustainable energy solutions for transportation and other areas of research. The Hill Engineering Research and Development Center is located at 2105 Becker Drive on KU’s west campus. The 4,000-square-foot building was designed and built by KU architecture students in Studio 804, which is committed to the research and development of sustainable, affordable and inventive buildings. HEMCO Corporation provides laboratory equipment for Mercy Ships. 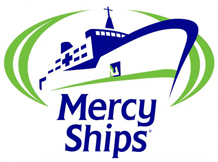 Mercy Ships is a global charity that provides training, medical relief and sustainable development to areas of natural disaster or where there is chronic need. The fleet of ocean going vessels brings hope and healing to the world's most needy. Mercy ships have provided dental care, specialized surgeries, clothing, construction materials, development training and a message of hope to 90 port districts around the world. Founded in 1977, with the purchase of the first ship the Anastasia's, would become a floating hospital that would serve for 29 years. The fleet has since expanded with 3 more ships and is based in Garden Valley Texas. HEMCO Corporation is pleased to announce that as of August 16th 2010, UniFlow model SE, LE, and CE hoods are available in U.L. model Hoods. Specified models were tested and Certified to U.L. 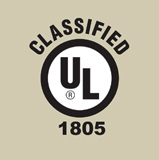 1805 Classification.U.L. 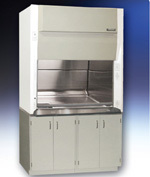 1805 Classification defines requirements specific to Laboratory Fume Hoods & Cabinets. This Classification covers construction, materials, flammability and containment performance. 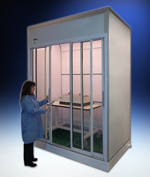 HEMCO's test facility is compliant to test Fume Hoods for U.L. 1805 Classification. Ronald E. Hill PE President of HEMCO Corporation was awarded the University of Kansas School of Engineering Distinguished Alumni Mechanical Engineer of the year award 2009. 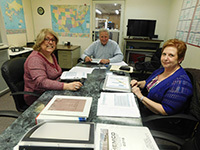 His 50+ years of entrepreneurial leadership have led HEMCO Corporation (Hill Engineering and Manufacturing Company) to fill a unique niche in the research, development, and manufacturing of Laboratory Facilities World Wide. The MicroFlow III is an ideal Class 1 ductless carbon filtered workstation equipped with Activated Carbon filtration, for fumes, odors, and non-hazardous chemical vapors. Completely self contained with integral recessed work surface to contain spills. A clear hood surrounds the work area and includes a hinged viewing sash for user protection. Sash can be conformed for use with a microscope. Variable speed fan control allows for high speed 100f/m. air flow thru the sash opening, or medium and low flow for sensitive operations. Filter change light is installed to alert the user when it is time to replace the filter. Typical applications include, general chemistry involving small volumes of common chemicals, individual work stations, tissue staining and processing, gluing & drying operations, solvent cleaning of electronic parts, soldering fumes and odors, school demonstration workstations, containment of forensic applications. 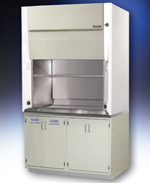 The VSE is offered in 24”, 36” and 48” widths to accommodate an analytical balance and other small scale lab processes. Constructed of chemical resistant metal framing and 1/4” thick clear acrylic side panels and viewing sash. Efficient air flow design with airfoil and by pass, directs contaminates to baffled exhaust thereby providing superior air flow and containment performance for user protection. The viewing sash is angled 15 degrees for ease of viewing comfort with 8” reach in opening height. Sash swings up to provide 20” of access opening. 2 service ports are located in lower right and left rear wall. The ergonomic design provides added user comfort. HEMCO Clean Aire HEPA and Carbon Filter Paks are designed to be mounted in-line in the exhaust ducting from a fume hood or contaminant source up to 1500 cfm. The filter pak includes a galvanized steel housing with hinged and gasketed access door for filter change-out and molded composite resin inlet and outlet plenums with duct connection collars sized to meet specification. Both filters include a 30% pleated prefilter and can be paired together for applications that requires particulate and fume removal. 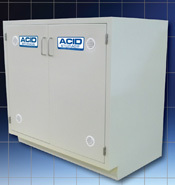 Acid Storage Cabinet is specifically designed for the storage of corrosive chemicals and available in 12”, 18”, 24”, 30”, 36”, 42”, and 48” widths. Standard size is 35” high and 22” deep. The molded one piece fiberglass liner inserts directly in the cabinet and is sealed on all edges for ease of cleaning. Interior features a containment lip, on the front bottom edge to hold spills. Then front access doors have air inlet vents, are lined, and the edges are sealed. No metal is exposed to corrosive vapors. Shelf is removable for smaller container storage. HEMCO offers Fume Hood exhaust blowers, ducting & components, HEPA and carbon filtration, fume scrubbers, & manifold systems. 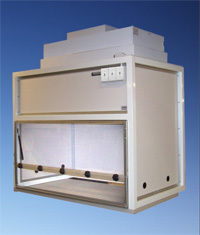 Fume hood blowers are designed to exhaust corrosive fumes, humid or polluted air, gases & odors. These blowers are in coated steel or PVC, in standard or explosion proof models. Rigid PVC ducting and accessories are provided for fume hood exhaust systems. The smooth interior surface reduces static pressure loss and chemical waste build up, and PVC is extremely resistant to a wide variety of acids & corrosives. EnviroMax Enclosures by HEMCO Corporation are constructed entirely of chemical resistant, flame retardant, non-metallic composite resin materials and features an exclusive “Unitized” construction that does not require screws, bolts, rivets or metallic hardware to assemble. HEMCO Enclosures are designed to isolate liquid handling workstations, HPLC equipment, sample weighing, high throughput screening, powders handling and other lab automated processes by providing exhaust air systems, clean workstation or temperature/humidity controlled environments. The enclosures feature a flexible, modular design and are engineered and built to exact customer size and design requirements. 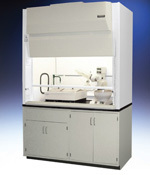 The SE AireStream Fume Hood is equipped with a 36” high extended view height, exclusive vector slotted rear VaraFlow baffle system, aerodynamic sash lift with perforated air-sweep feature, and molded-in belled outlet collar for reduced airflow resistance. The lighting is a vapor proof LED strip fixture with a central switch, pre-wired to a single point junction box 115V /60Hz. Hood is shipped completely assembled and can include a wide selection of accessories that can be factory installed to meet your specific need. Work surfaces in a variety of materials and a choice of base cabinets including acid or flammable storage are optional. Available in sizes ranging of 4’, 5’, 6’ and 8’ wide X 30” or 36” deep by 60” high. Unitized design with depth of 30” X 36” to pass through entrance door for easy on-site setup. 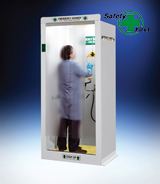 A HEPA Filtered Enclosure offered in Unitized & Modular Design for Class 100 Clean Work Enclosure. Specifically engineered to meet critically clean specifications by isolating equipment and procedures. 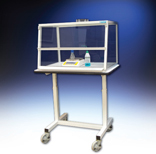 The HEPA filtered class 100 laminar airflow maintains a sterile work zone. Filters and lighting are conveniently changed from inside the enclosure. Optional U.V. lighting, anti-static and grounding options are available. Work surfaces, support benches & cabinets sized to specifications. 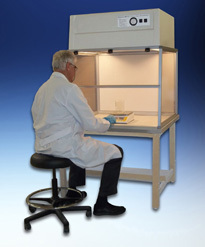 Specifically designed for isolating hazardous materials, the HAZMAX Hazardous Containment Work Area has applications including containment of potentially hazardous dispensing and sampling procedures, material storage and equipment isolation. The ventilated work area is constructed of corrosion and flame retardant fiberglass, with an epoxy coating on all metal parts. Sliding doors, constructed of ¼” tempered glass, provide convenient access to the work area and can be securely locked. A secondary containment basin, constructed of seamless composite poly resin, has coved corners and a sloped bottom to facilitate draining and cleaning of any accidental spillage. A raised fiberglass grate deck floor allows spillage to flow through. Specific requirements can be met through a variety of safety and service accessories, also available through HEMCO. HEMCO introduces the best Warranty in the industry. 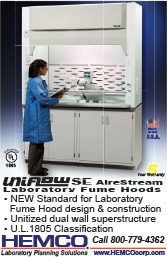 The UniFlow Fume Hood is guaranteed not to rust, or need repairs for 5 years. 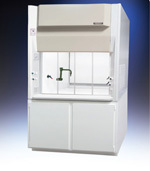 HEMCO warrants UniFlow Laboratory Fume Hoods, that have received U.L. 1805 Certification for materials, ( for details see Warranty) and workmanship on equipment. HEMCO’s warranty shall be for a period of (5) Five years from the date of sale to the original purchaser. • Polypropylene Fume Chamber, unitized construction with integral fume chamber,integral worksurface, baffle e system, air foil & outlet collar. Exterior composite FRP Super Structure for total chemical & corrosion resistance. 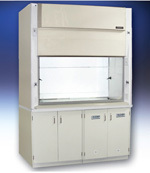 • Fume hood is offered in 48", 60", 72", & 96" wide models in 30" or 36" depths. interior to prevent absorption of Radioactive & Corrosive materials. • FRP composite Fume Chamber, unitized construction with integral, baffle system,air foil & outlet collar. Exterior composite FRP Super Structure for total chemical & corrosion resistance, epoxy worksurface. • Reduce energy costs, with the sash in the ½ open position it only requires 50% supply air to make up for the exhaust air, providing 100 fpm face velocity. • Perchloric acid is used in the production of rocket fuel, etching liquid crystal displays, and other perchloric acid procedures. • High Density Poly Ethylene Fume Chamber, unitized construction with integral fume chamber, worksurface, baffle e system, air foil & outlet collar. Exterior composite FRP Super Structure for total chemical & corrosion resistance. and rear drain trough. • Acid Digestion process for the selective separation / removal of precious metals,from non-precious metals. Materials are completely dissolved into a liquid form for separation. • Integral wash down system with spray nozzles is included.